The Combics series supports the production of high-quality, appealing and safe products. The unrivaled precision of Combics helps to control flexible production, reduce costs and improve product quality. The hygienic design of our solutions complies with today’s extremely important hygiene regulations without compromise. The devices can be cleaned very easily and thus allow Combics to be used even under tough conditions and with high safety standards. The materials and surfaces used significantly contribute to minimizing contamination risks. All Combics scales meet EHEDG specifications. Combics 2 Ex also offers a wide range of applications including counting, checkweighing, SQ Min, totalizing, formulation and classification. Save valuable time. Integrate the scale into your process. Traditional floor and pit scales Immovable mechanical obstacles which hinder the process sequence. Floor pits can give rise to static problems. Hygiene problems because pits are inaccessible collection points for dirt and can only be cleaned at considerable expense. Scales are increasingly being integrated into production processes in order to make them more efficient. Applications requiring the weighing of large quantities and containers offer the greatest potential for savings as more costly handling is needed in such cases. Traditional floor scales are often a mechanical obstacle in the production process while flush installation in a floor pit hides a number of disadvantages. 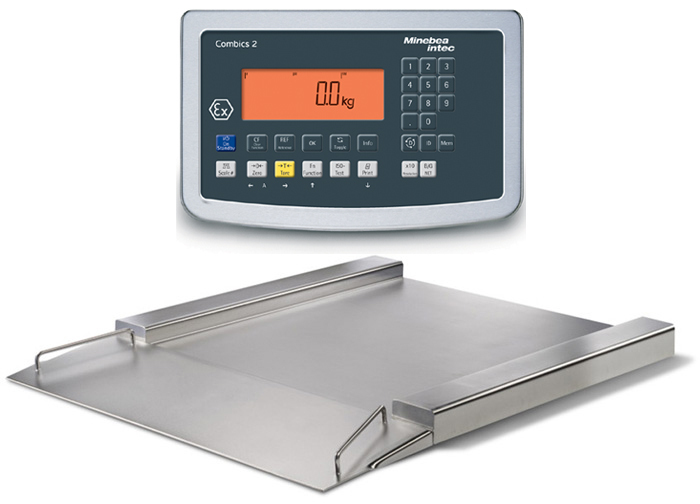 IF flat-bed scales from Sartorius offer a practical, time-saving solution. Easy handling due to ergonomic design and sophisticated equipment. Ideal for clean rooms in the pharmaceutical industry,for example, as they are designed with hygiene aspects in mind. Suitable for operation with aggressive substances due to the use of resistant materials. Very easy wet cleaning e.g. in wet production facilities in the food industry. Freely moveable due to rollers and steering drawbar. Low maintenance costs and long service life due to robust construction. Display resolutions of up to 15,000 steps are possible, in legal metrology up to 2x3000e as a multiple-range scale. Higher resolutions of up to 60,000 scale intervals for weighing in smaller quantities are available on request. The minimum initial weight can be provided with a DKD certificate if required. All scales have PTB test certificates and are suitable for use in legal metrology. Suitable scale indicators can be found in the broad range of Sartorius weighing and process indicators. On request we also supply DKD certificates and|or manufacturer’s test reports. The constructional details of the scales (materials, protection classes, surfaces) and the associated manufacturer’s certificates are the basis for use in the regulated industries (pharmaceutical, food and drink, cosmetics). We support integration in the validation process (IQ|OQ), through to the Factory Acceptance Test (FAT). Foldable models (option T8) comply with the NIOSH requirement for cleaning by one person with minimum effort. 23.6" x 23.6" 31.5" x 23.6" 31.5" x 31.5" 39.4" x 23.6" 39.4" x 31.5" 39.4" x 39.4" 49.2" x 39.4" 49.2" x 49.2" 59.1" x 49.2" 59.1" x 59.1" 78.7" x 59.1"
31.5" x 31.5" 39.4" x 23.6" 39.4" x 31.5" 39.4" x 39.4" 49.2" x 39.4" 49.2" x 49.2" 59.1" x 49.2" 59.1" x 59.1" 78.7" x 59.1"
39.4" x 39.4" 49.2" x 39.4" 49.2" x 49.2" 59.1" x 49.2" 59.1" x 59.1" 78.7" x 59.1"